Tattoo parlor – Wilton and Hollywood Blvd, Hollywood, CA. A little over a year ago, the New York Times covered a story about the demise of 5 Pointz – the urban artist mecca, located on the outskirts of Queens, NY. Abandoned buildings clustered together like old dying New York, the owner of the abandoned warehouse allowed graffiti artists to take their spray cans and paint to create works of wonder. Flashes of blues, blacks, browns, cartoon creations, classic portraiture, vast sprawls of glorious color like rainbows flourished the drab bland grey corner of the borough. If you rode the number 7 train (like I do – to Mets games at Willets Point), you could see the glory of artist creations – not produced under the cloak of nighttime, but living and creating in the bright light of day. It was a living, breathing cartoon of artistry – enlivening a bustling neighborhood that had a view of the Manhattan skyline rising above. 5 Pointz, Queens. Before the fall. From “The Institute of Higher Burning”. The building itself really wasn’t really abandoned. The company that existed in this warehouse decades ago, left behind an old space and remnants of whatever they did for commerce. (Who knows? I’m not really interested in researching that info.) Yet, the years since it was made a haven for urban creatives, the spaces had been rented out to artists as studios. It wasn’t just exterior world of gonzo artists spraying their imaginations and sociopolitical emotions on the wall – there were artists producing work from other mediums within. Sadly, the owner of the building decided to fall way to the ever increasing need for the dollar. Greed, wealth and the promise of making millions upon millions in the real estate market made the promise of 5Pointz future cave in. The building was sold in 2013 to a developer who will build unaffordable ultra expensive homes for the rich because there aren’t enough luxury apartments in NYC, and the need to increase rent is ever so important. (Sarcasm). So, while waiting for the wrecking ball, the soon- to- be- former owner white washed the artwork in a strange effort to make the impending demolition day less painful. There are varying opinions. Some people thought the artwork itself was a blight – a defacement of a building. Then there were some artists who rationalized the whitewash as proof graffiti should never be permanent. It’s an ever changing form of art, painted over, Banksy-ied and mysterious. Here one day, gone the next. It’s the basis of the medium. Then, there are those like me who loved it. Who thought it added texture to the concrete, enlivened the spirit of those tired of streets and crumbling buildings. It wasn’t ugly, dirty graffiti – like the kind you’d see scribbled on the subway in the 70’s and 80’s. No. That was ugly. Useless tagging in a place that didn’t call for the aesthetic. Yet, 5Pointz celebrated free spirit and poetic street expression. The buildings provided the gift of an open canvas with the open invitation for thousands of possibilities. Damn. And now it’s all gone. The photo of the beautiful Latina above is actually in Hollywood , and the gorgeous mural I posted from my last post can be seen on a building in downtown LA. But it doesn’t matter where you find it. 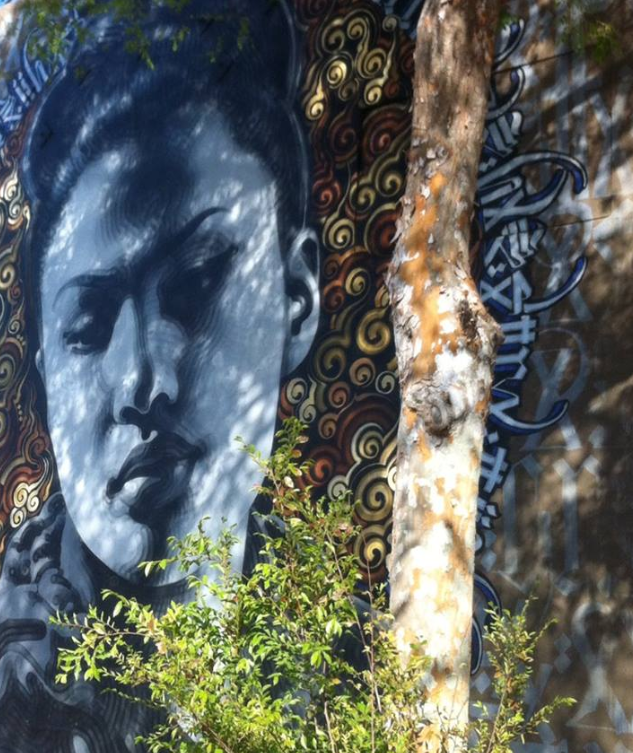 The luster of color on both LA based murals provokes realism in the features, much as it does in any urban frame. Intricate patterns and shapes allow the light of day to create the vision of a realistic human being with emotions coming to the surface – against brick, mortar and greyness of a tired old building. This is in direct spirit with 5 Pointz. Wall art, murals, graffiti, tags – are alive and well all over the world. But the heartbeat lives on in Queens, NY. Even if it’s only a memory now. The act of painting over the graffiti is bothersome. If the building is going to be erased, why erase the artwork on it? Why not embrace the artists who’ve created it – perhaps let them personally keep a reasonable piece of the facade of the building? Or keep well maintained slabs of the art to place in the lobby of this development (which will likely block out that last view of the NYC skyline before it disappears in the distance) as a dedication to 5Pointz. This puts another ding in an ever changing city – where starving artists are being priced out of the place and basically disrespected. From Soho to Brooklyn to L.I.C…gentrification has erased the beauty of grime. What was once affordable housing in scary hoods is now million dollar havens for the wealthy. I’m all for cleaning things up. I’m glad graffiti no long exists on subway cars (that was not a great medium for it – nor pleasant), but leave us some concrete and color. This action is part of the homogenization of NYC. It’s losing its texture, long upheld by artists who can’t even stay there anymore. As a lifelong New Yorker who currently lives 3000 miles away, and as a Mets fan who comes back home to ride the 7 and marvel at this stretch of artwork along the way – this news is a heart breaker. Categories: Monday's Meditation | Tags: graffiti, Wall Art | Permalink. I guess it would be great to have some school painted this way, really.